Searching for hidden treasure is a continuing theme in fiction, fantasy and fact; real-life treasure hunters do exist and seek lost gold and wealth for a living. How would we react if, like author Alexandre Dumas’s great fictional hero Edmond Dantés (The Count of Monte Cristo), we found a source of wealth that enabled or emboldened our whole life’s journey. 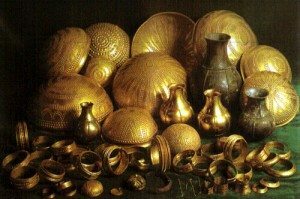 So is treasure simply about money, or is it much more? What makes a treasure in the 21st century is a debate the Bodleian Libraries at Oxford in Englnad invited members of the public to take part in during their major autumn exhibition in 2011. The Bodleian Libraries at Oxford in England are the integrated library service of the University of Oxford. Established in 2000, it comprises nearly 40 libraries. There are major research libraries, including the Bodleian Library, which has been a library of legal deposit for almost 400 years. There are also other libraries attached to faculties, departments and other institutions throughout the University. 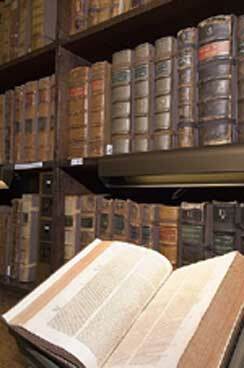 The treasures of the Bodleian amount to some nine million deposits and include amazing objects such as the ever-popular – John James Audubon’s Birds of America, the unique – Handel’s conducting copy of The Messiah, Shakespeare’s First Folio of Plays and, the special – John Donne’s only surviving poem in his own handwriting. From ancient papyri through medieval oriental manuscripts to twentieth-century printed books and ephemera the collection includes precious documents that fit into themes such as the classical heritage; mapping the world; the sacred word; animal and plant kingdoms; works of the imagination; the sciences of observation and calculation; and historical moments in time. In May 2010 the university embarked on a 78 million pound project to be completed in 2015. 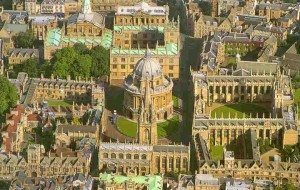 The New Bodleian library will be able to provide high quality storage for its most valuable special collections, which it preserves for the international world of scholarship and humankind. They are developing what will become known as the Weston Library, to support their advanced research and to expand public access to this incredible storehouse of information. 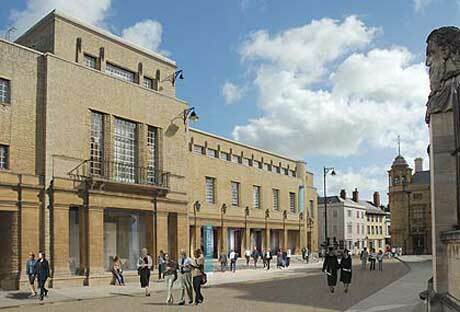 The Bodley’s Librarian Sarah Thomas, said about the exhibition that it was ‘just a preview of what the Weston Library will offer the public when it opens in 2015′. The idea is to make the collections more easily accessible to the public, for people to come and see them, to admire, inspect and to get close to them. 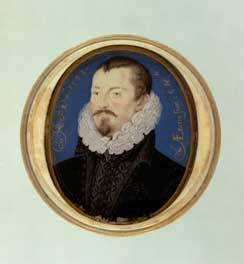 A miniature portrait of Sir Thomas Bodley painted in 1598 by Nicholas Hilliard (1537 – 1619) is one of the Bodleian’s most interesting objects. During the Tudor age Hilliard excelled at miniatures, romantic portraits and small scale works known as limnings, [Middle English luminen, limnen to illuminate (a manuscript), from Middle French enluminer, from Latin illuminare]. The diverse and exciting mix of texts held at the Bodleian includes some of the most revered in the evolutionary journey of humankind. 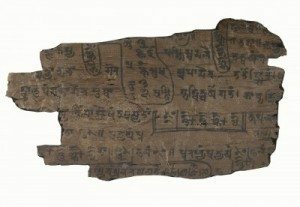 Many of the 500,000 or so papyrus fragments discovered at the end of the nineteenth century contain passages of literary or philosophical works. Most are the stuff of everyday life: shopping lists, tax returns, legal documents, private letters and memoranda. Tattered and fragile, they are clearly of great age, but the concerns they express are immediately recognizable. Occasionally, amongst the mass of business papers, they reveal personal emotions: here, a petulant schoolboy called Theon complains to his father for leaving him behind. A surviving copy, one of seventeen originals written in Latin on a sheet of animal skin vellum. Its terms and conditions were acceded to by England’s King John at Runnymede, Surrey in 1215. Prof Richard Sharpe, Fellow of Wadham College and Professor of Diplomatic gave a gallery talk in the Divinity School about the Magna Carta 19.12.2007 and explained that the seventeen surviving manuscripts on the Magna Carta are engrossments, not copies: official documents from Royal Chancery bearing the ruler’s seal. The document was revised and re-issued over the next 80 years by successive monarchs. 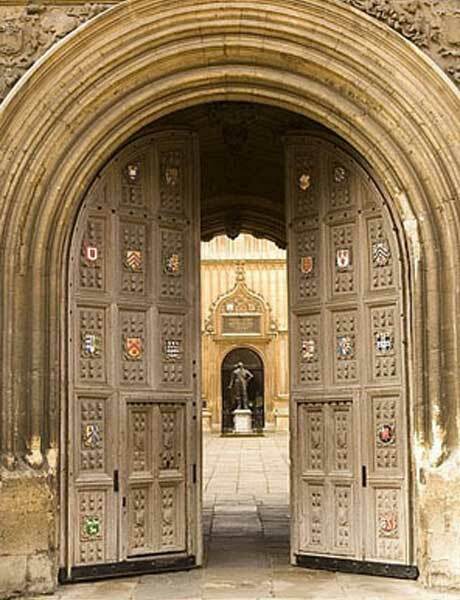 The three 1217 engrossments that are in the Bodleian Libraries at Oxford were issued by the boy King Henry III (1207-1272) and bear the seals of his guardians William Marchal and the papal legate Cardinal Guala. 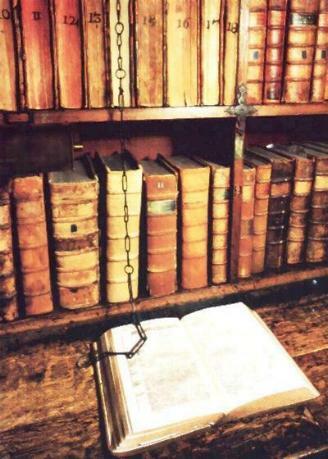 Three of the four Magna Carta were bequeathed to the Library at the close of the 17th century by antiquarian Anthony Wood. 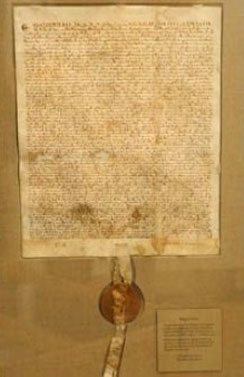 For the English of the thirteenth century the agreement to the terms and conditions of this document was a huge step in protecting people against unlawful imprisonment by ensuring such rights as trial by jury and freedom from unlawful arrest. This unique illustrated medieval Arabic manuscript is an illustrated anonymous cosmography, compiled in Egypt first during the first half of the 11th century. It has its own website. The only known copy of this manuscript, probably made in the late 12th or early 13th century, was acquired by the Bodleian Library in 2002. 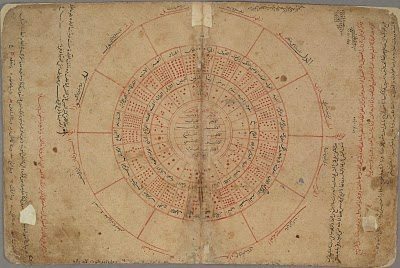 It is actually divided between 2 books (the universe and earth), and at the time of its purchase by the Bodleian it was described as the most important Islamic scientific manuscript to have come onto the market in the last century. Its unique maps and diagrams include: diagrams of star-groups and comets; a rectangular map of the world with a graphic scale (the earliest surviving example of such a map); a circular world map; individual maps of islands and ports in the eastern Mediterranean, including Sicily, Mahdia, Cyprus, and the Byzantine coasts of Asia Minor; maps illustrating the Mediterranean Sea as a whole, the Indian Ocean, and the Caspian Sea; and maps of five major rivers (the Nile, Indus, Oxus, Euphrates, and Tigris). The Book of Curiosities was the centrepiece for a highly acclaimed exhibition at the Bodleian Library in 2004. It featured in the book Medieval Views of the Cosmos, published by the Bodleian Library. One of the greatest picture books produced during the Middle Ages, this is the story about a young Venetian’s adventures along the Silk Road and into China. His way had been paved before him by the pioneering efforts of his ancestors, especially his father, Niccolò, and his uncle, Maffeo. The family had traded with the Middle East for a long time, acquiring considerable wealth and prestige. It is uncertain if the Polo family were nobility, the matter was of little consequence at Venice, which was a city of republican and mercantile traditions. They were known to be shrewd, alert and courageous and to manage their affairs well. 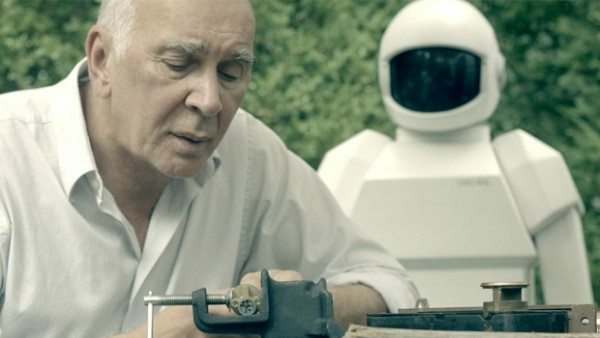 The extent of their success and specific roles they filled still remains open to interpretation. We do know Marco was 20 when he reached Cathay and was noticed favourably by Emperor Kublai Khan. He sent him on fact-finding missions to far-flung areas of his Empire so we can assume he must have somehow gained the ruler’s trust. His tale as a traveller was dictated at Pisa to Rustichello a reasonably well-known writer of romances and specialist in chivalry and folklore. They both shared a prison cell. 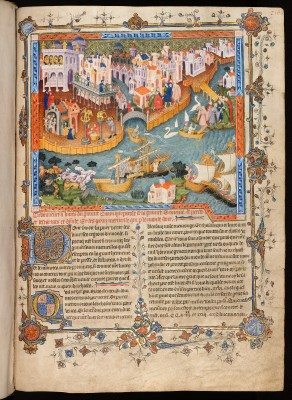 The story of Marco Polo’s Travels was an instant bestseller when published under its original title Il Milione, which is all about Marco’s tendency to describe the millions of things he saw when travelling in the Mongol Empire. 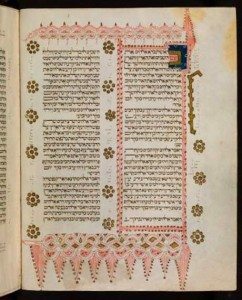 This Bible dates from 1476 and is considered the most exquisite of all the Hebrew bibles, which were written and illuminated in medieval Spain. It is lavish to say the least, written in a clear Sephardi script and bound into a Morocco goatskin box binding that was blind embossed on all six sides. It is embellished with cut-out endpapers using motifs similar to the intricate, colourful carpet pages, which divide the Bible into its three main sections: Pentateuch, Prophets and Hagiographa. The Bodleian edition is named for Benjamin Kennicott (1718-1783) a scholar who continued the English tradition of studying the Hebrew bible during his lifetime. He compared it to textual variants of hundreds of Hebrew manuscripts worldwide. In the course of his work Kennicott acquired this manuscript for the Radcliffe Library from where it was transferred to the Bodleian in 1872. The Bible is known and treasured for its elaborate, imaginative decoration. It is astonishingly well preserved for, in 235 years, only 30 art historians and scholars have been privileged to study it. This is the first collected edition of Shakespeare’s plays, published seven years after his death by two of his fellow actors. The first collected edition of any English playwright, it prints a total of thirty-six plays, many of which would otherwise have been lost to future generations. It includes all of the plays generally accepted to be Shakespeare’s, with the exception of Pericles, Prince of Tyre and The Two Noble Kinsmen, and the two “lost plays”, Cardenio and Love’s Labour’s Won. Its original price was one pound the equivalent of about £95–£110 in 2006. 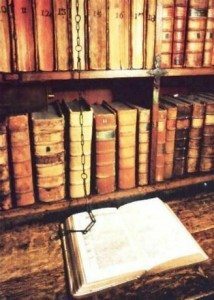 Like most books of that time the Folio was sold unbound and buyers would spend another pound or two to have it bound in leather, with their own various embellishments. 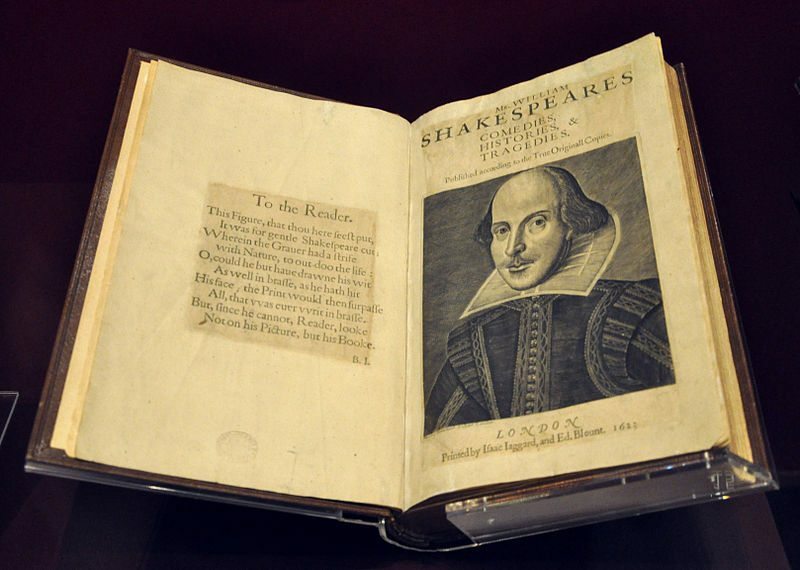 The First Folio acquired by the Bodleian soon after publication, in accordance with an agreement with the Stationers’ Company, was added to the chained folio-sized books in Duke Humfrey’s Library, where it was openly accessible to readers. Some years later the First Folio left the Bodleian, perhaps it was deemed superfluous after the acquisition of a Third Folio in 1664, and disposed of. It resurfaced in 1905 and the Library reacquired it. An anonymous American collector (known to be Henry Folger) was prepared to pay £3,000 for the book, an unheard-of sum at the time. 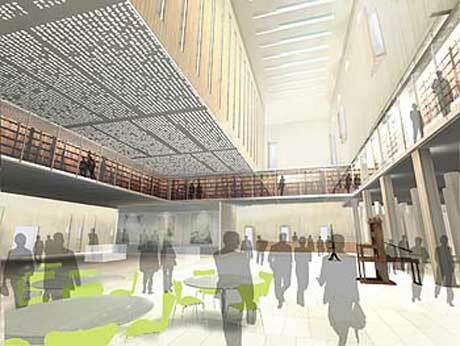 Through an urgent public appeal the Bodleian succeeded in matching the offer. This copy of the First Folio is still in the original binding, which in 1905 identified it as the original Bodleian copy. The first Bodleian shelfmark had been torn from the bottom of the title page. This is the very genesis of fiction from one of the Britain’s greatest and best-loved writers. Her novels, which have become classics in their own right, allow us today to share the memory of the robust society in which she lived and its privileges of rank. Purchased earlier this year at auction the hammer price for The Watsons was 993, 250 GBP supplied by Britain’s National Heritage Memorial Fund (NHMF), the ‘fund of last resort’. It stepped in – in the face of intense, worldwide competition – to help the University of Oxford to secure this exceptional work for extending scholarship within the UK. The Watsons is one of the earliest examples of an English novel to survive in its formative state. Today Jane Austen’s novels occupy a unique position at the intersection between the world of academia and popular culture. From the vanity of Rev. Collins to the pride of Mr Darcy, Jane Austen’s cast of English characters continue to delight and captivate us all. Mary Wollstonecraft’s Rights of Women was a founding text for modern feminism; her daughter Mary Shelley ran away to France aged 16, producing a novel that became one of the most prophetic and popular horror stories of the century, Frankenstein. 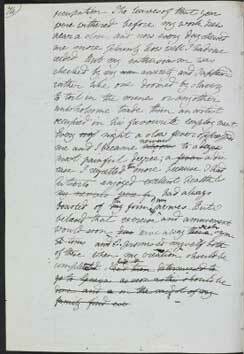 This is the original hand written text of the novel published on 1st January 1818 by an anonymous author. A second edition that named Mary followed this. Later there was a third edition for which Mary Shelley heavily revised the text. This was the first popular edition published in 1831 by Henry Colburn and Richard Bentley. Mary Shelley had been pressurised to make the story more conservative, and the 1831 text is the one most read today. However this original is still in circulation too and scholars usually prefer it. The sinking of the Titanic in the early hours of 15th April 1912 was a disaster that shocked the world. The ship was on its maiden voyage from Southampton to New York when it hit an iceberg. 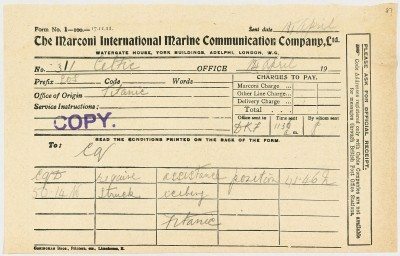 A desperate telegram a distress message, sent by Jack Phillips the wireless operator from the Titanic to the Celtic as the Titanic started to go down said ‘require assistance position 41.46 N 50.14 W struck iceberg…. Titanic. As the Titanic started to take on water, the order was given to evacuate the ship. There were only enough lifeboats to save about half of the 2228 passengers and crew. People who ended up in the freezing ocean waters could not last long. This meant that over 1500 people died in the disaster, while only 705 people survived. Jack Phillips went down with the ship. “Progress”, philosopher, essayist poet and novelist George Santayana 1863-1952) informed us, ‘far from consisting in change depends on retentiveness. When change is absolute there remains no being to improve and no direction is set for possible improvement: and when experience is not retained… infancy is perpetual. Those who cannot remember the past are condemned to repeat it’. Progress has been made throughout history by democratic agreement on how to collectively re-work the choices we make in order to avoid damaging consequences for others and ourselves. In a library many of the decisions, working processes and resultant comments that have been made in the hindsight of history are available for us to learn and grow from. So also are documents and books that inform about new ways of thinking and about human behaviour that might help to change our attitudes, politics, policy and practice. A contemporary example: governments are well aware of how important changing attitudes are for helping combat contemporary issues like climate change. However it presents its policies to surmount the challenge basically in terms of costs and risks that can be simply paid for. This supposes that its citizens are required to make no fundamental changes at all to their life style to conserve energy and resources. If you really think about it, this style of policy is both dishonest and ineffective as a long-term strategy. People need to assist conservation by embracing change and reducing the energy they consume. That way they can also help save the planet in the long term. It is crucial that we endeavour to understand and embrace new knowledge. We must adapt our existing institutions to suit the modern world. We need to rethink our attitudes, our public services and the disposition of our democratic institutions, our social policies and professional practices, so that future leaders can work with, not against the grain of human nature. Gaining new skills and aptitudes requires long-term support that traditional institutions like libraries have always provided. An opportunity to study original texts and documents is a key to inspiring imagination, which if we are to believe the 20th centuries greatest scientist Albert Einstein, is more important than knowledge. Much of our knowledge is based on accounts of what happened as interpreted by others down the centuries. It’s a bit like a whisper that starts at one end of a line of 30 people but is not the same when it gets to the other end. 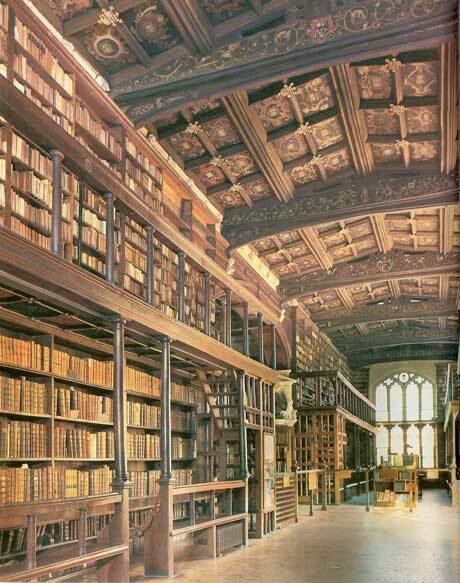 It is grand the Bodleian libraries has a goal of providing an opportunity for everyone to go back to the beginning, to the original source and study the famous texts first hand, either in their libraries or online. Cherishing wisdom, to my mind, is worth applauding wildly. These outstanding texts and ephemera they are safeguarding and showcasing are sure to inspire ideas, creativity and action, so that we can all enjoy the benefits of 21st century enlightenment. Previous articleMarvellous Millinery- A Thing Of The Past?